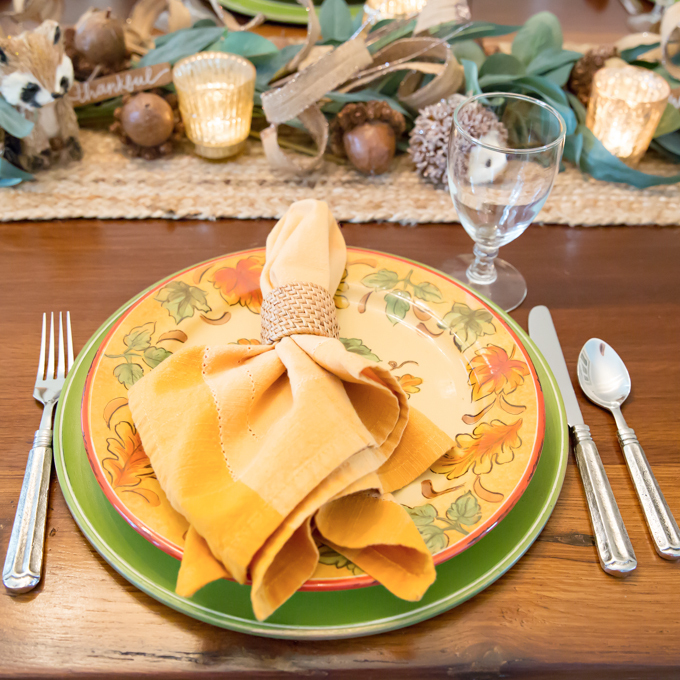 Using items that I already owned, I was able to set this beautiful Woodland Themed Fall Tablescape. I own a lot of dishes, and continue to purchase more (what can I say, it makes me happy and I love to entertain), but I also enjoy when I “shop my house” and love the end result. This table was exactly that!! I’ve owned the plates for at least five years. I don’t even remember where I purchased them, but I “think” it might have been Cost Plus World Market. I have a grand total of eight of the dinner plates and four soup/cereal bowls. They really have become my everyday plates during the fall season. You’ll notice that I have two different napkins set on the tables. 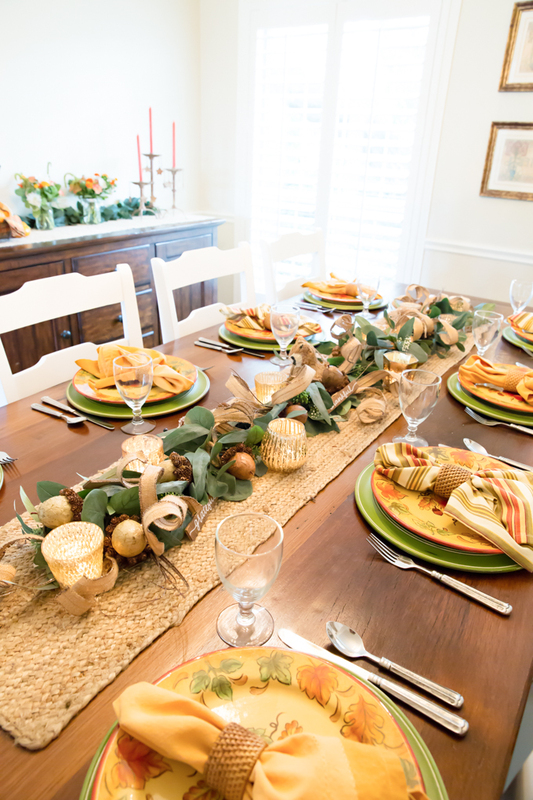 Over the years, I have hosted Thanksgiving many times, and have accumulated multiple sets. I decided to mix it up a bit, and used four of two different styles. There really is no right or wrong, do what you like! The green charger plates were new this year. They caught my eye one day while shopping at Pier 1, and I knew I had to have them. I waited until they went on sale and purchased eight. I might need to grab another four while they still have them. I’ve found them to be very versatile and know that I’ll be using them a lot. Almost everything in the tablescape I pulled from either my garage or basement. The faux garland I picked up earlier this year. It’s from Target’s Hearth and Hand Collection. 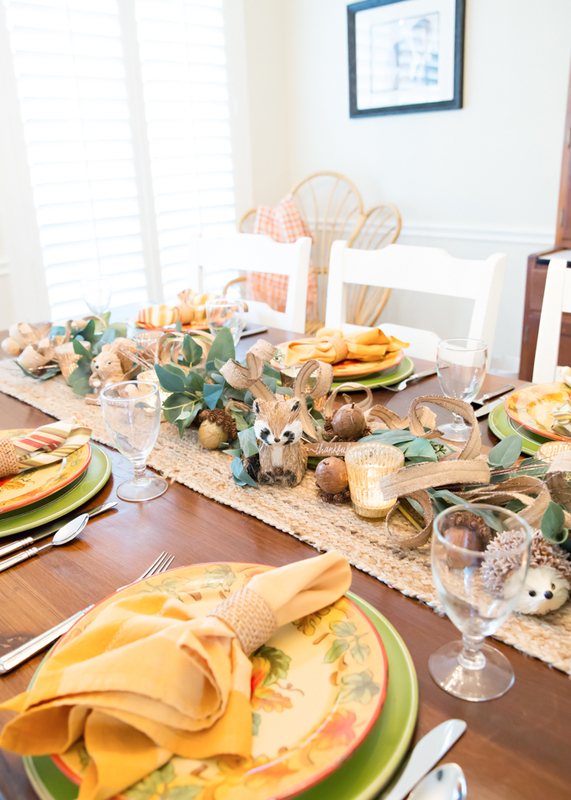 Now let’s talk about the details and how this became my Woodland Themed Fall Tablescape. Check out these cute little woodland critters! They’re actually ornaments from a Fall themed tree that I put up a couple of Thanksgivings ago. 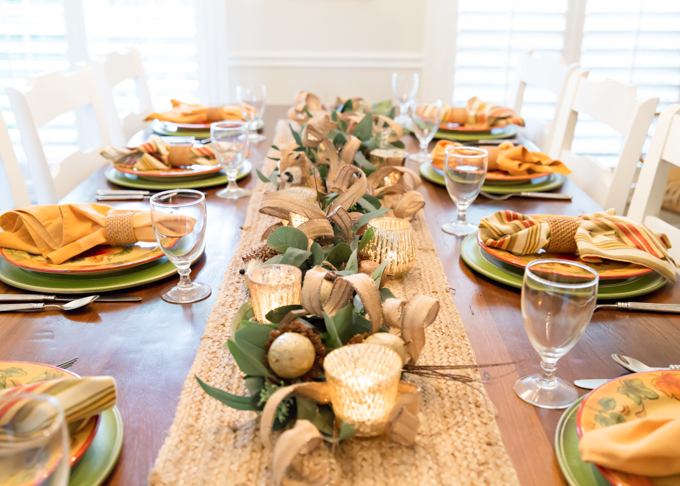 Also re-used from my Fall tree were the burlap curly picks that I tucked into the garland for a little fun and added texture. 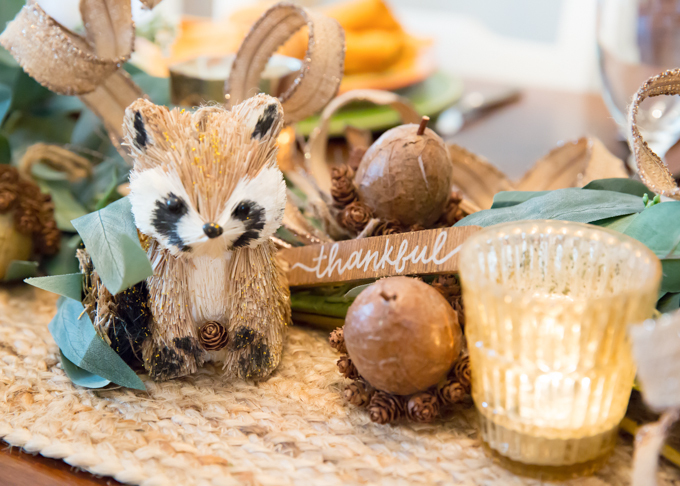 Acorns (from a dis-assembled garland), candles, and small wooden tags completed my centerpiece. Critters and burlap picks were from Pier 1, I think 2 years ago. 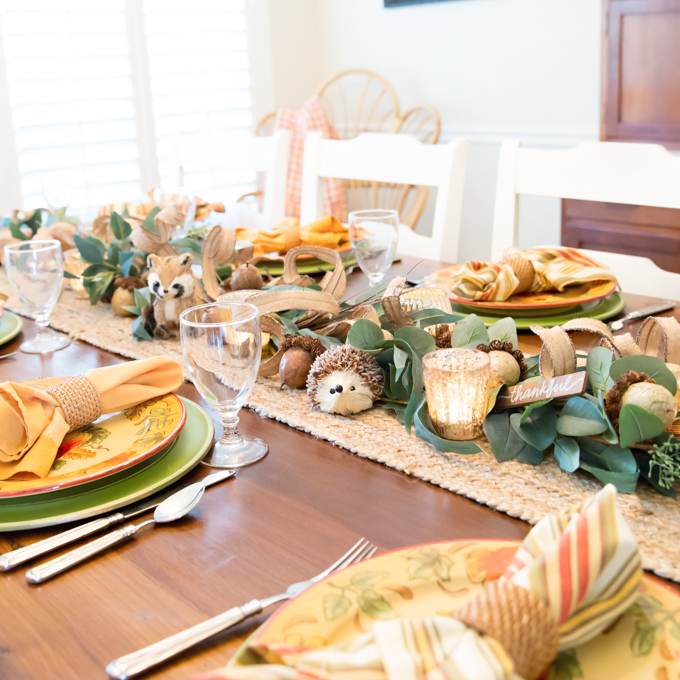 FYI, this isn’t a sponsored post, I just happen to love to shop at Pier 1. Some of my other favorite stores to shop are: Home Goods, Marshalls, Pottery Barn, World Market, Target, and Etsy vendors. 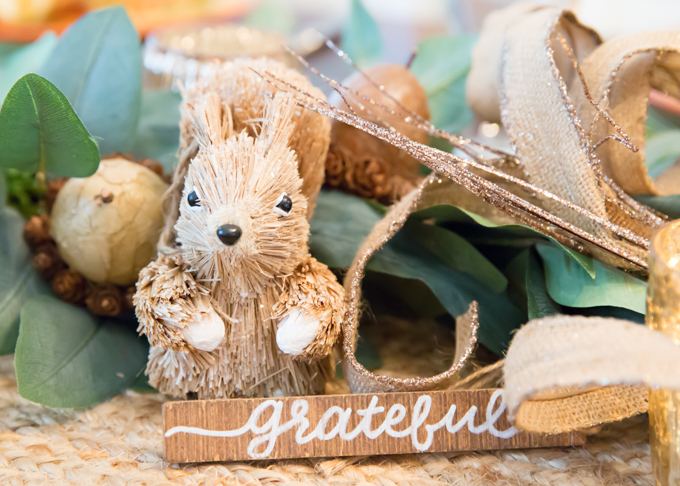 The little “thankful and grateful” tags were from my friend Molly. Here’s the link to her Etsy shop. Make sure and check it out and tell her Renee sent you. 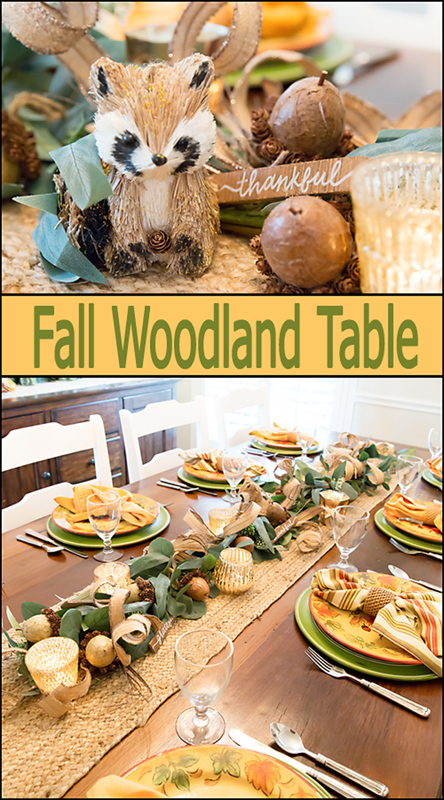 I was so pleased with how this Woodland Themed Fall Tablescape turned out and I hope that it will inspire you to shop your home and re-use items that you might already have before you go out and purchase something new. Remember, it’s not “what’s on” your table, but “who’s around” your table that matters most! If you’re a Pinterest fan, I’d love if you’d Pin the image below to your favorite boards.